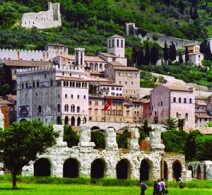 Set on the slopes of Mount Subasio, Assisi is the town of S. Francis. Its medieval historic centre is arranged along the original Roman streets; on the Piazza del Comune look major palaces like the Palazzo del Capitano del Popolo, the Palazzo dei Priori and the temple dedicated to Minerva. 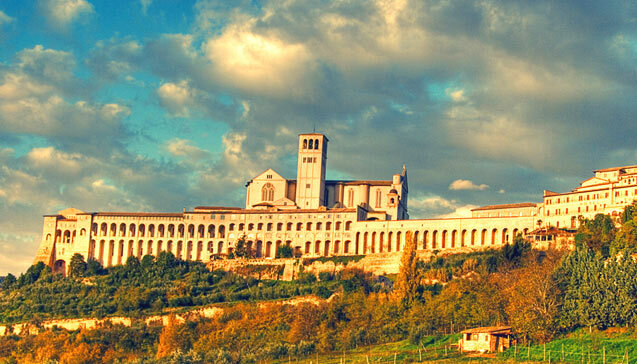 World famous monuments and buildings are the Franciscan monastery with its Basilica widely decorated by Giotto, the XIV century S. Chiara church, the S. Maria Maggiore church with the frescoes by Pinturicchio, and the Rocca Maggiore set on a cliff overlooking town. The S. Maria degli Angeli church houses the Porziuncola chapel, where the Franciscan order was founded, the Transito chapel, originally the cell where S. Francis died and the Roseto chapel. 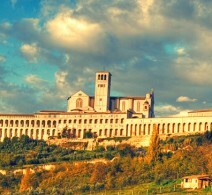 A few kilometres from here one may visit the Franciscan Eremo delle Carceri, built by S. Bernardino da Siena in XV century. 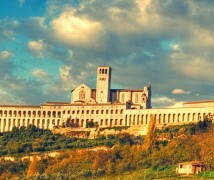 Assisi with its historic center, the Basilica of San Francesco and other Franciscan sites has been declared World Heritage by UNESCO. 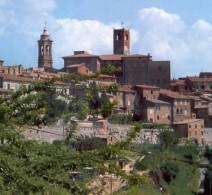 Perugia, an ancient city located in the center of Umbria, is the biggest town in the region. 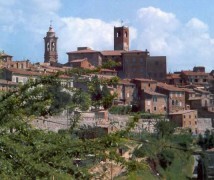 The historic center is located on the high hills that flank the right bank of the Tiber. It is of Etruscan origin and was a flourishing Roman municipality known as Augusta Perusia. 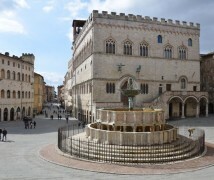 Perugia has an immense cultural and artistic heritage fruit of its glorious past. In every corner of the city and in its squares you can see monuments that bear witness to centuries of history, art and culture. There is the Etruscan Arch also known as the Arch of Augustus, a monumental gateway set into the Etruscan city walls which were later restored in Roman times. 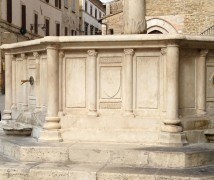 There is also the Etruscan well, and Marzia gate which is the second Etruscan gateway incorporated into the front of the Rocca Paolina bastion, built by Pope Paul III in 1540. 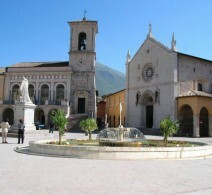 Piazza IV Novembre is one of the most beautiful squares in Italy. It faces the Palazzo dei Priori which is an elegant Gothic building that incorporates the National Gallery of Umbria where some of the greatest masterpieces of Italian art from the Middle Ages to the 18th century can be found, such as Piero della Francesca, Benozzo Gozzoli, Fra Angelico, Pinturicchio and Perugino. There is also the Sala dei Notari and the Collegio del Cambio (the old money-exchange and the arts and crafts guild of Perugia) with a prestigious series of paintings by Perugino inside, and also the chapel of St. John the Baptist with its 16th century frescoes. 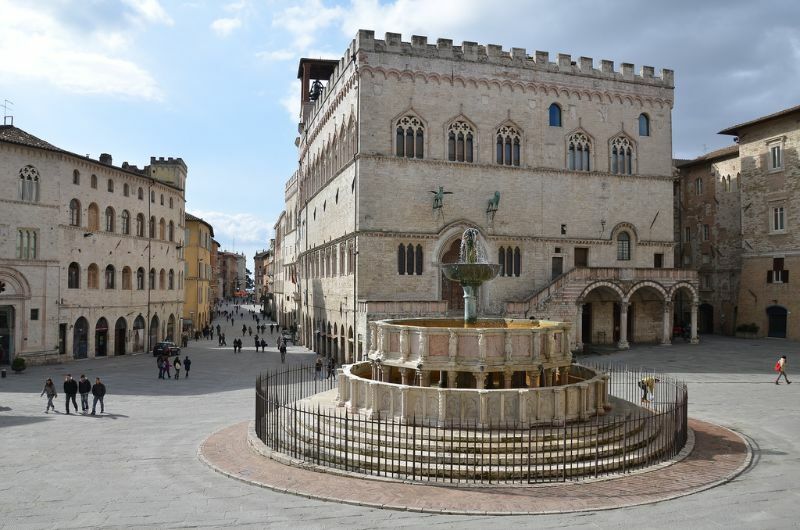 Then there is the Collegio della Mercanzia, the cathedral of San Lorenzo with the adjoining Museo del Capitolo, and finally the beautiful 13th century Fontana Maggiore by Fra Bevignate from Perugia, with bas-reliefs by Nicola and Giovanni Pisano. 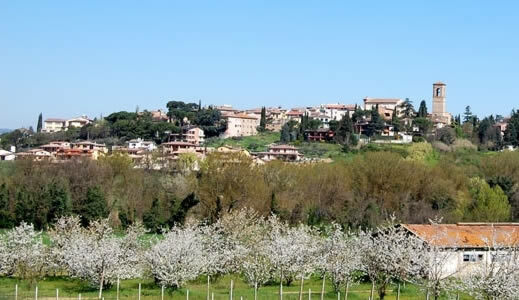 Located in the heart of Umbria, Torgiano is an ancient fortified medieval town found where the Tiber and Chiascio rivers converge, amid rolling hills covered with vineyards and olive groves. It is a Wine Centre of international repute. 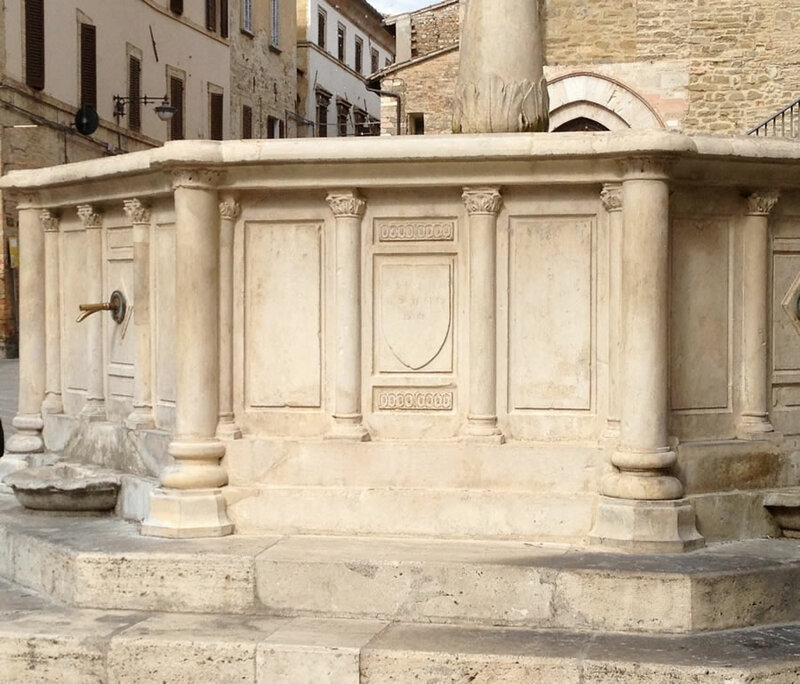 In the historic center you can see the Baglioni Tower, testimony to the ancient fortified city walls, and two fountains by the artist Nino Caruso: the Fonte di Giano and the Fonte dei Cocciari. 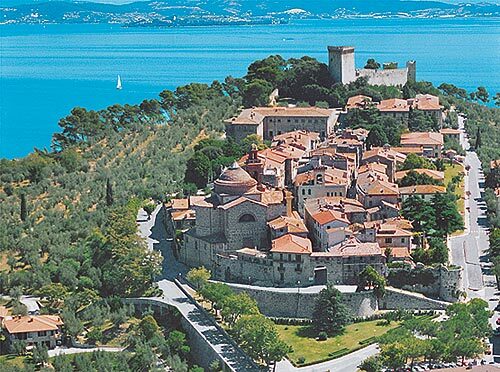 Torgiano has many religious buildings such as the church of San Bartolomeo, built in the 18th century over the remains of an ancient medieval parish church; the church of Santa Maria del Castello and the church of Madonna dell’Ulivello with the oratory of the Misericordia. Inside the Madonna dell’Ulivello you can see 16th and 17th century paintings, while the oratory of Sant’Antonio offers 16th century frescos. A visit to the Wine Museum and the Olive Oil Museum is also highly recommended. 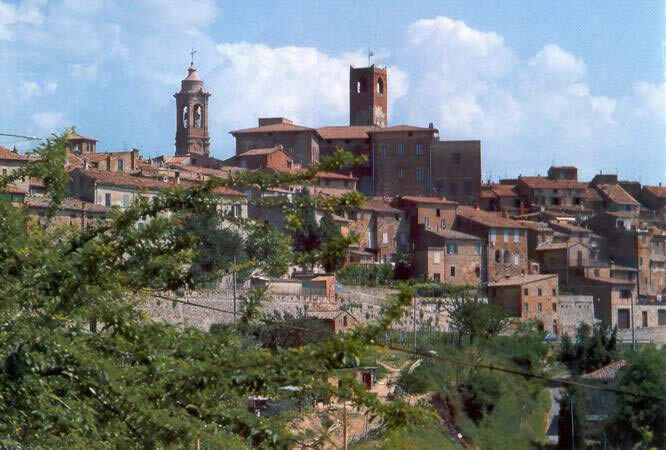 This really is one of the ‘most beautiful villages in Italy’. 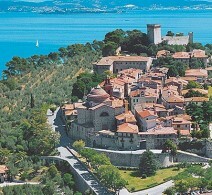 This town still maintains its medieval layout (12th – 13th century) and is surrounded by a city wall with towers and gates. There are many testimonies to Roman times in the upper part of the town; the remains of a temple, a theater, and a spa building with a frigidarium which has a splendid black and white mosaic floor that illustrates marine life, and dates back to the 2nd century AD. 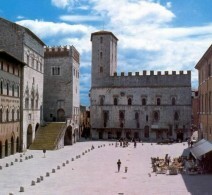 From the Roman village layout, a medieval urban structure emerged with squares and noblemen’s villas. These include the Palazzo dei Consoli (1270) which houses the Teatro Torti in the beautiful Piazza Silvestri, the Romanesque churches of San Silvestro and San Michele, both of which were constructed at the end of the 12th century, and the church of San Domenico e Giacomo (1291). 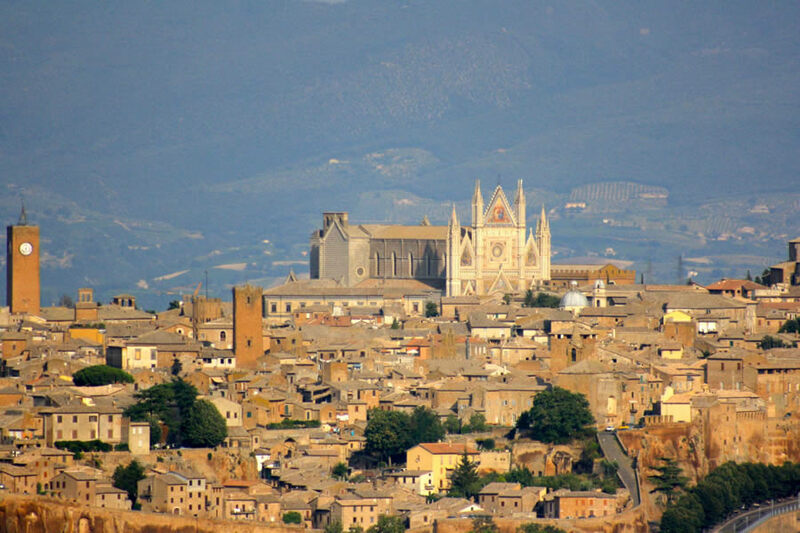 At the highest point of the city stands the church of San Francesco (late 13th century) where, on a stone next to the altar St. Francis would sit and communicate with the birds. This is a beautiful city of art that stands on top of a hill overlooking the valley. 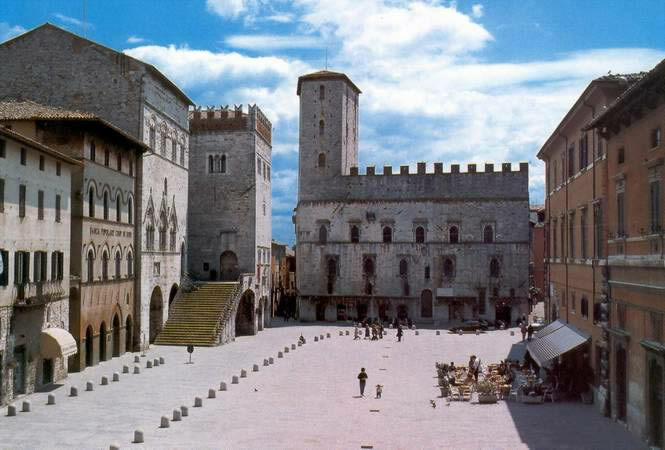 Todi is enclosed by three concentric walls which bear witness to the size of the town in Umbrian-Roman, Roman and medieval times. Just before entering the heart of the old town there is the imposing church of Santa Maria della Consolazione, one of the tallest Renaissance buildings in Umbria. It was begun in 1508 to a design attributed to Bramante, and completed in 1617 with the help of famous architects of the time. In the heart of the city you can see the splendid Piazza del Popolo, one of the most beautiful in Italy, with its monumental lay buildings and religious complex; Palazzo del Podestà, one of Italy’s oldest municipal buildings, erected between 1214 and 1228; Palazzo dei Priori, built between 1334 and 1347 in the Gothic style with a square tower; Palazzo del Capitano del Popolo (late 13th century) with its spacious, central-pillar loggia on the ground floor; and the Duomo built in the 12th century and later enlarged in stages over the 13th and 14th centuries, next to which stands the Bishop’s Palace. A work of considerable artistic merit is the temple of San Fortunato (13th – 15th century), located at the top of impressive steps it is a remarkable example of Umbrian Gothic. Inside there is a crypt that holds the remains of the poet-monk Jacopone from Todi and, in a secluded chapel, those of the patron saints of the city; San Fortunato, San Callisto, San Cassiano, Santa Degna and Santa Romana. 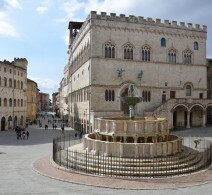 The city has an artistic and cultural heritage amongst the richest in Umbria. The Duomo, one of the most majestic architectural constructions in Italy, was designed by Lorenzo Maitani in the 13th century. Its magnificent gothic façade, with mosaics and bas-reliefs, has a beautiful rose window created by Orcagna. Inside, amongst the many works, there is a series of frescoes by Fra Angelico and Luca Signorelli, a true masterpiece of Italian painting from the 15th and 16th centuries. 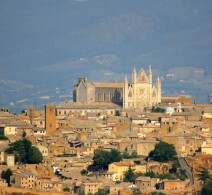 Among the oldest sacred buildings there is the church of San Giovenale built in 1004 which was enlarged in the 14th century, with its frescoes by the school of Orvieto; the church of San Giovanni, with its 16th century façade, was built in 916 over a theater by Constantine; the church of Sant’Andrea, originally from the 6th century, was rebuilt in the 11th century and completed in the 14th century; the church of San Lorenzo de’Arari, the church of San Francesco (13th century) and finally the church of San Domenico (13th century) which houses the tomb of the Cardinal de Braye by Arnolfo di Cambio. 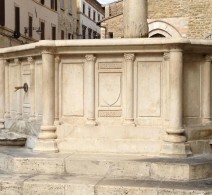 An unusual visit to the well of San Patrizio is recommended, as it’s a masterpiece of engineering (1527-1537) by Antonio da Sangallo the Younger to supply water to the town. It’s 62 meters deep and is formed by two independent spiral ramps built in such a way that those descending to fetch water never encountered those ascending. 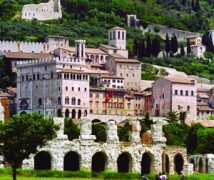 Spoleto is a stunning Umbrian town which, in the medieval period had a very important role, as it was in fact the capital of the Lombard Empire. In the upper part of the town there is an ancient Roman theater dating back to the 1st century AD, the Arco de Druco from 23 AD, the church of Sant’Ansano and a temple from the Roman period. The lovely Romanesque cathedral from the 12th century must be seen as inside there are works by Filippo Lippi and Pinturicchio. 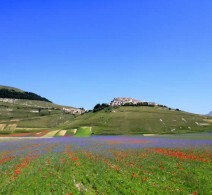 In July the ‘Festival dei due Mondi’ is hosted with music, art and culture. Originally an Etruscan-Roman center, in the 7th century it became a powerful Castrum Plebis built around the parish church of Santi Gervasio e Protasio. The old town retains the original typical urban layout of medieval times, on which are grafted Renaissance, Baroque, Rococo and Neo-Classical architectural elements which highlight the artistic vitality of the city. The cathedral of Santi Gervasio e Protasio (the Duomo) is really worth visiting as it houses the works of two great painters from Città della Pieve, Perugino and Pomarancio. There is also the church of Santa Maria dei Bianchi, where the remarkable ‘Adoration of the Magi’ by Perugino can be found. Outside the city walls is the church of Sant’Agostino, the church of San Francesco which is now the shrine of the Madonna di Fatima, the church of Santa Maria dei Servi with its fresco by Perugino showing the Deposition from the Cross, and the church of Saint Lucia. 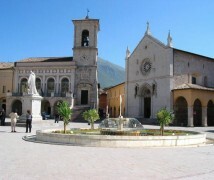 Norcia is located on the slopes of the Sibillini mountains. 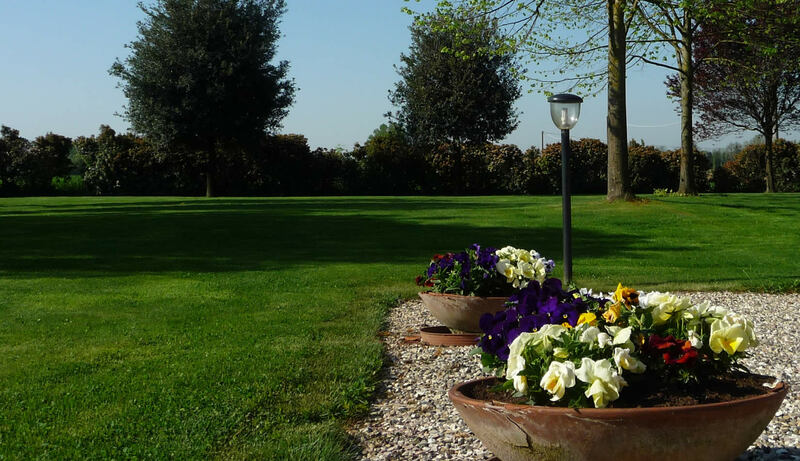 Birthplace of San Benedetto, Benedictine spirituality is combined with the beauty of nature, the wonders of art and the authenticity of local cuisine. 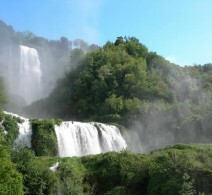 Because of its vast cultural, artistic and natural heritage, it is part of the national ‘I Borghi più Belli d’Italia’ club. An ancient Sabine city, Nursia was conquered by the Romans and became an important municipality. It was a free town in the 11th century, then in the 15th century it passed definitively to the Church, which nonetheless granted it considerable autonomy. 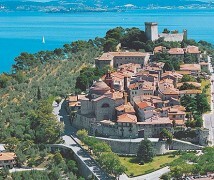 Around 480 San Benedetto was born. Despite having been destroyed by various earthquakes over the centuries (1703, 1730 and 1859) it contains a wealth of artistic and historical testimony related to the life of the founder of the Benedictine order. Founded by the Umbri – we have proof documented in the Eugubine tablets of I century b.C. 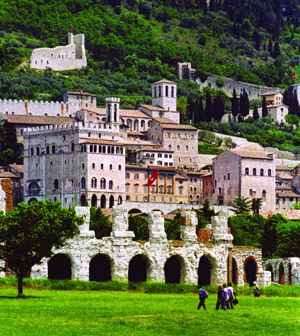 – Gubbio was a centre of primary importance during Roman times (as one may see from the presence of thermal baths, theatre and mausoleum). 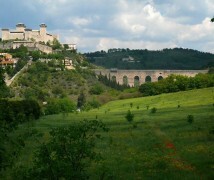 During the Middle Ages it had its major urban development with the construction of the city’s gateways and aqueduct. The central Via dei Consoli gives an idea of how Gubbio must have looked then, with its palaces with narrow ogival doorways and windows (Palazzo del Bargello).Piazza Grande is a real medieval architectural achievement in its hanging between the Palazzo dei Consoli and the Palazzo Pretorio, never finished, which represents the spirit of eugubine gothic architecture. The nearby Cathedral was built in XIII century and still has its original simple facade with ogival portal and rose window. 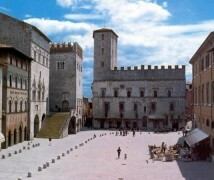 The construction of the Palazzo Ducale was ordered by Federico da Montefeltro and encloses medieval buildings in renaissance style, connecting them to a Corte D’Onore (designed by Francesco di Giorgio). 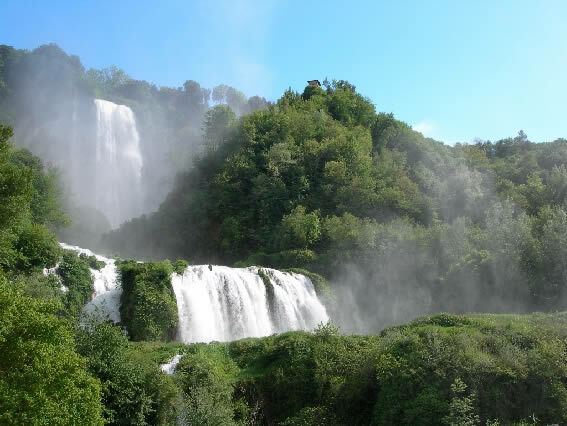 This outstanding mountain range is found in the heart of Italy where the magic of nature, history and local culture combine. Among the dozens of peaks that are higher than 2,000 meters above sea level there is Monte Vettore at 2,476m, Monte Sibilla 2,175m, the Redentore 2,448m, Monte Priora 2,332m and Monte Argentella 2,200m. 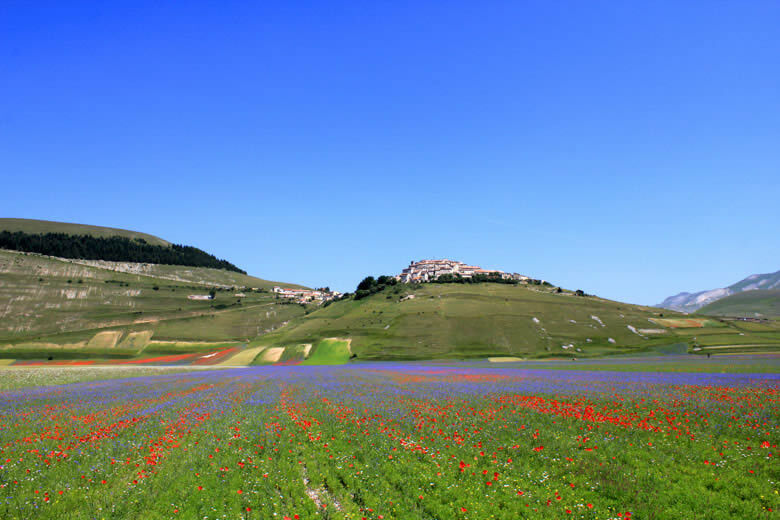 Descending from the main Apennine chain, the eastern slope is characterized by the narrow north-facing valleys of Aso, Tenna and Ambro. 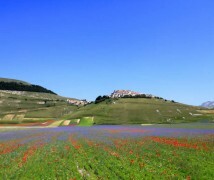 The western slope has three distinctive high-altitude grasslands known as the Plains of Castelluccio which include Pian Perduto, Pian Grande and Pian Piccolo. 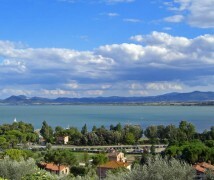 The lake Trasimeno is the largest lake in centre Italy, the 4th biggest lake in the whole country. It has fluvial, and perhaps even tectonic origins. It’s heart-shaped and it surface is 128 square kilometers. The deepest point of the lake reaches 6 meters, its banks are low and surrounded by a reed-bed and hills with olive trees and vineyards, with gardens and small farms. 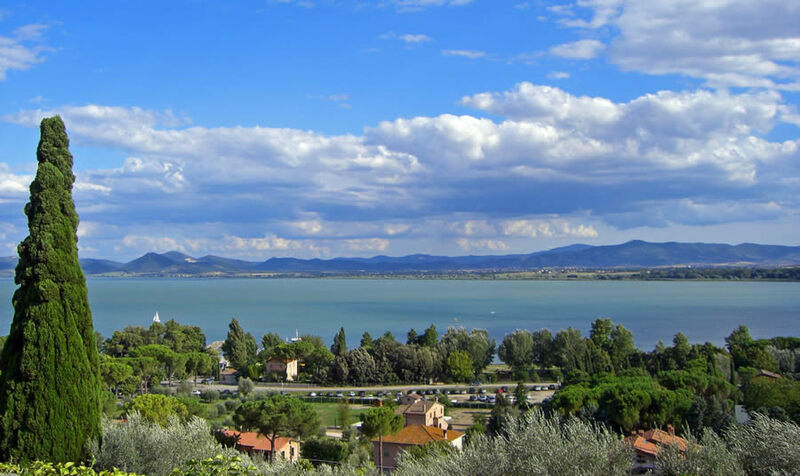 Castiglione del Lago is a small town of Etruscan origin located on a hilly promontory on the western shore of Lake Trasimeno. 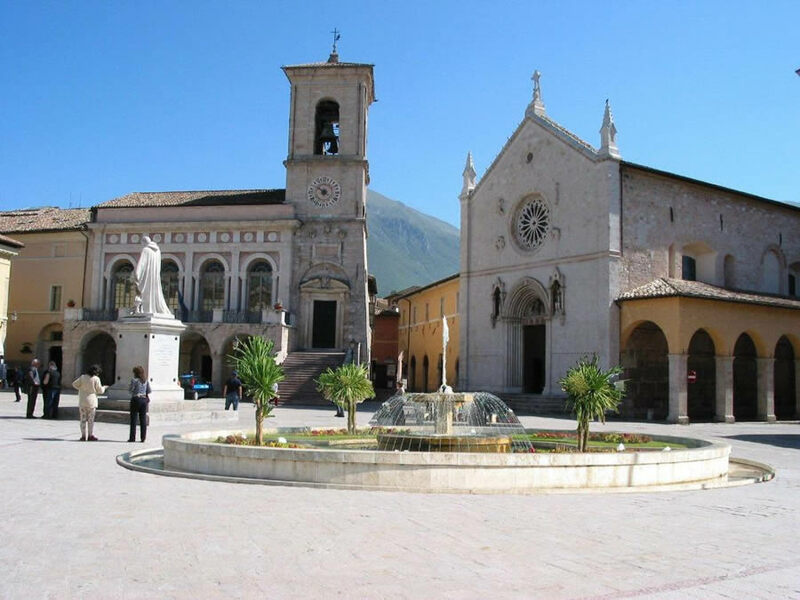 Because of its vast cultural, artistic and natural heritage, it is (like Norcia) part of the national ‘I Borghi più Belli d’Italia’ club. 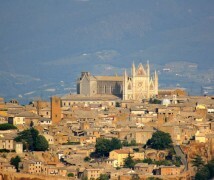 The old town is surrounded by medieval walls with three gates called Fiorentina, Siena and Perugia. 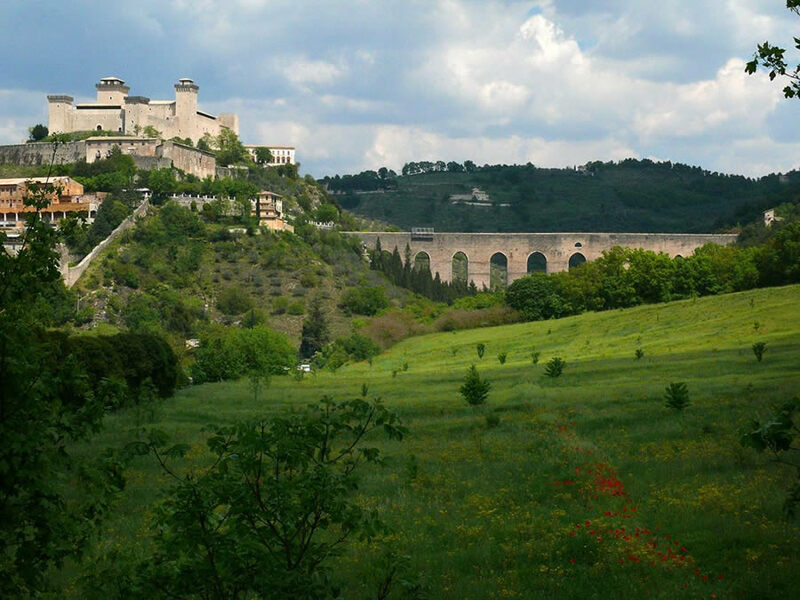 The Rocca del Leone bastion is one of the most interesting examples of Umbrian military architecture in the Middle Ages. Built in 1247 and designed by Friar Elia Coppi da Cortona, it is shaped like an irregular pentagon, with five towers and three gates, dominated by a triangular keep almost 30 meters tall. The rampart walk offers a splendid view of the lake, while the vast interior space is now used as a natural amphitheater. Another building of great artistic value is the Corgna or Ducal Palace, built in 1560 by Ascanio della Corgna designed by Vignola or Galeazzo Alessi. It offers richly frescoed interiors by Niccolò Circignani (also known as ‘Pomarancio’) and Salvio Savini, which illustrate mythological scenes and Ascanio della Corgna’s mercenary endeavors, representing one of the region’s best examples of Mannerist painting.